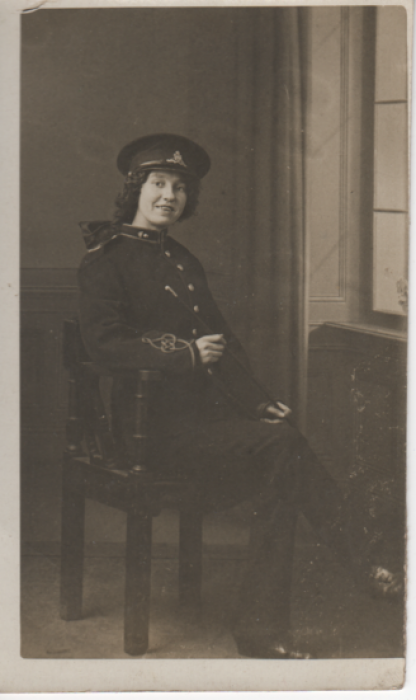 Notes: Photograph of a teenage girl dressed in the uniform of a regular soldier in the Royal Artillery (too large for her) complete with swagger stick, seated in a chair. Her hair is tied back with a large bow, indicating that she is probably no older than 16 or 17.; Reverse of photograph indicating it was taken at Gale’s Studios Ltd, Queen’s Street, Cardiff. Inscribed in ink ‘From Gladys / To Ada’. 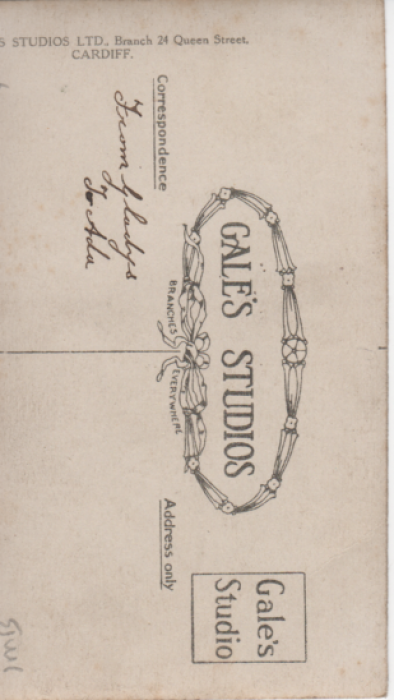 Reverse of photograph, taken at Gale’s Studios Ltd, Queen’s Street, Cardiff, inscribed 'To Ada From Gladys'. Notes: 'My mother, Jean Wardlaw Arbuckle, was born in Scotland and spent her early years there in various small towns and villages in the central belt from Gourock in the west to Preston Pans in the east. She was the third of twelve children. When she was about 11 years old, the family moved to the coal-mining valleys in Wales, as her father sought promotion in the coal industry.My mother was 15 years old when World War I broke out. The memories she passed down to me were of the extreme difficulty in obtaining food, and its high cost, until rationing was brought in. She said that it was extremely unfair for poorer families, and that rationing made the situation much fairer. 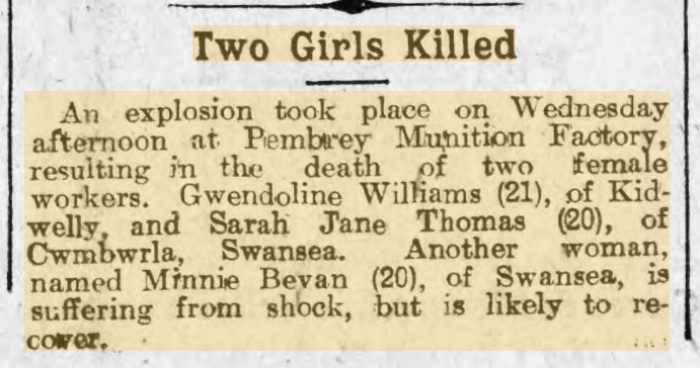 At the beginning of the War the family lived in Tondu, just north of Bridgend, but moved to Llanharan, eight miles from Bridgend some time during 1915. She attended Bridgend County School during those years, travelling by train from Llanharan station. The scarcity of staff seems to have caused some level of amalgamation of the boys and girls schools. It seems to have been quite a lax regime with a considerable amount of truancy. The pupils often disappeared during the day, walking to Merthyr Mawr, boys and girls together.One day she decided to leave school early, and hitched a lift with a farmer, riding in his horse-drawn trap back to Llanharan on the then narrow and twisting road. My grandfather had one of the few cars in the area at that time, and she heard it coming towards them along the road. She knew that if he saw her she would get the strap, so she jumped off the trap, over the hedge, and then walked the rest of the way home.The family were members of the Plymouth Brethren, but this does not seem to have stopped the children running a bit wild.' Janet Davies 13.11.2015. Notes: Isabelle Barbier was one of the daughters of Paul Barbier, professor of French at Cardiff University. She trained as a nurse at Bristol Royal Infirmary. 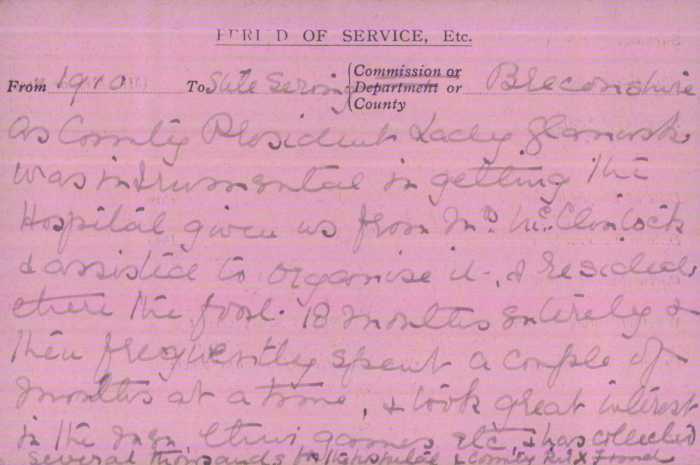 Called up very early in the war, she was called upon to help Maud MacCarthy, the Principal Matron in France, who had crossed to France at the same time and who spoke no French. Isabelle became her personal assistant throughout the War, working in France and Flanders. She later became a nun, and died in 1982 aged 96. Notes: May Brooks was a clerk in a confectionary firm before joining the WAAC. She served at various places in the south of England. 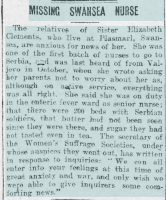 She contracted influenza, spending a week in hospital, and was discharged on compassionate grounds in June 1919. Image and information courtesy of Glamorgan Archives (DWESA6). 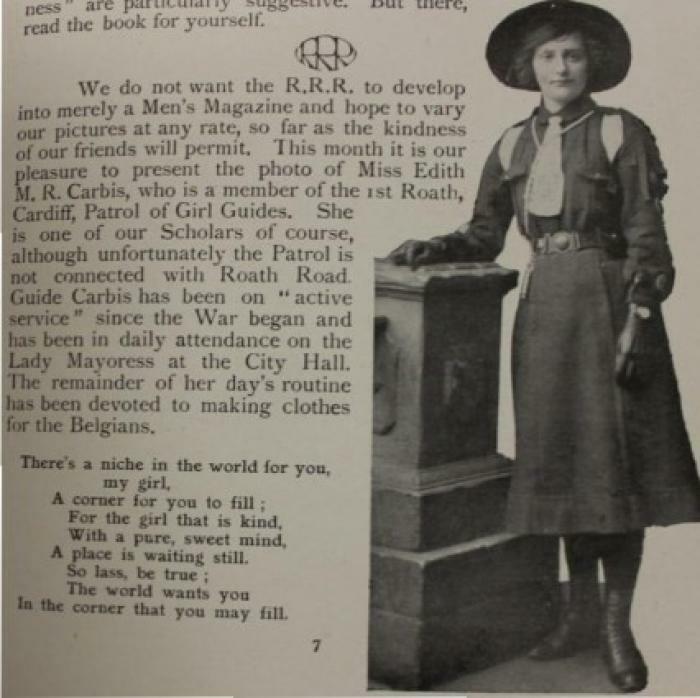 Notes: Edith Carbis's photograph appeared in the 'Roath Road Roamer’, January 1915. She seems to have left school, and acted as a messenger for the Lady Mayoress. 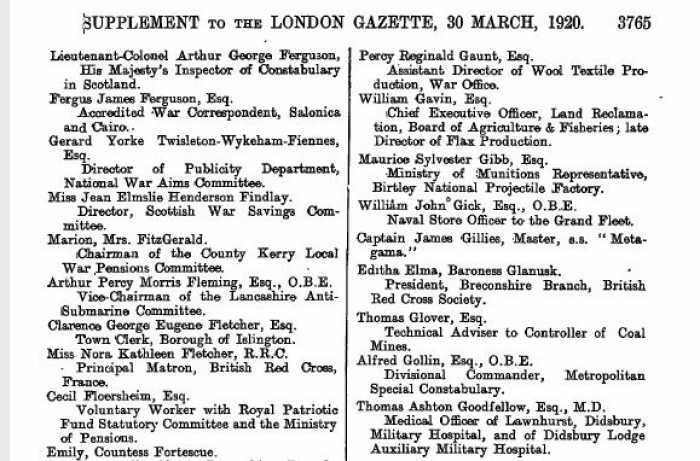 Notes: Daughter of a Swansea pub landlord Elizabeth Clement trained as a nurse at Llanelli Workhouse, where she became Head Nurse. She joined the Scottish Women's Hospitals in the autumn of 1915. She and her party arrived in Serbia early in October. Shortly after their arrival the Austrian army gained ascendancy in Serbia, and most of October was spent moving from place to place to avoid the enemy. By 7th November they were prisoners of the Germans. Eventually their freedom was negotiated, and they arrived in Budapest on the way to Vienna on 6th February. 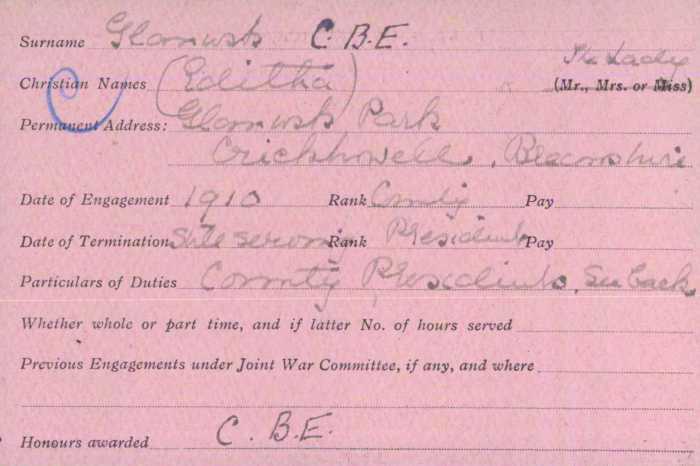 Elizabeth was back in Swansea by mid-February 1916. She seems to have become something of a celebrity; her diaries were published in the South Wales Weekly Post, and her story also appeared at length in Llais Llafur. She gave talks on her experiences, and appeared in the talks of others. A lantern slide of her in ‘Serbian dress’ was shown in a lecture by the popular librarian Mr W. W. Young in January 1917. First part of the South Wales Weekly Post publications of Elizabeth’s diaries, South Wales Weekly Post 19th and 26th February 1916. 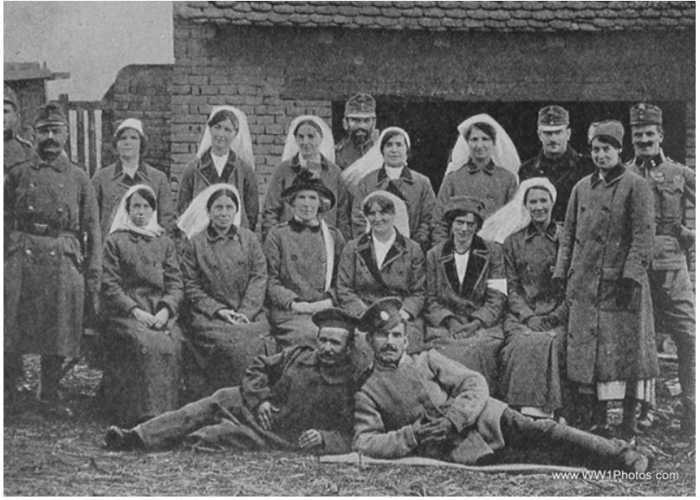 Photograph of Elizabeth Clement, Christmas Day 1915, with colleagues and Serbian soldiers. She is standing back row, third from right. Notes: Lady Glanusk was born in 1871 and married the 2nd Baron Glanusk in 1890. From the outbreak of war she became very involved in wartime activities, and was an indefatigable writer to the newspapers, calling for young women to encourage their men to join up, and demanding the internment of enemy aliens. 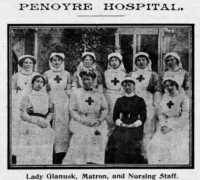 She was the President of the Red Cross in Breconshire, (for which she was awarded a CBE in 1920), and was heavily involved in the Penoyre Red Cross Hospital in Brecon. Two of her three sons were killed in the war, one a 17-year-old midshipman. 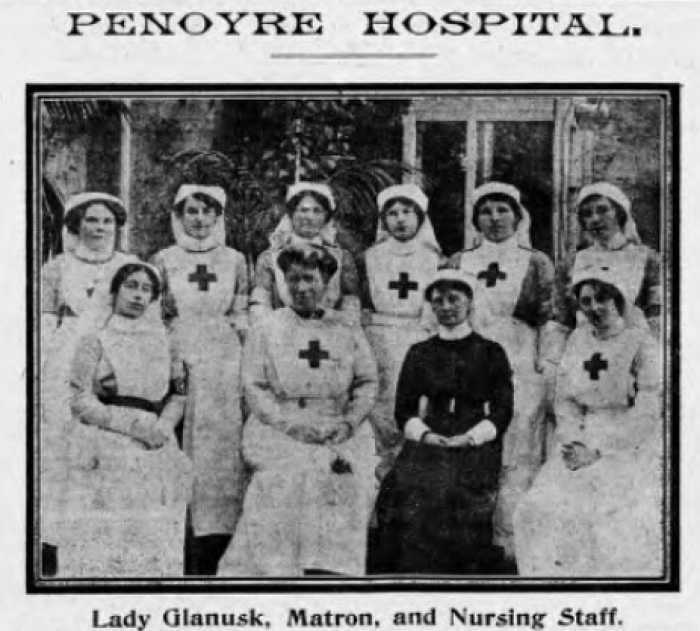 Lady Glanusk with the matron and staff of Penoyre Hospital, Brecon. 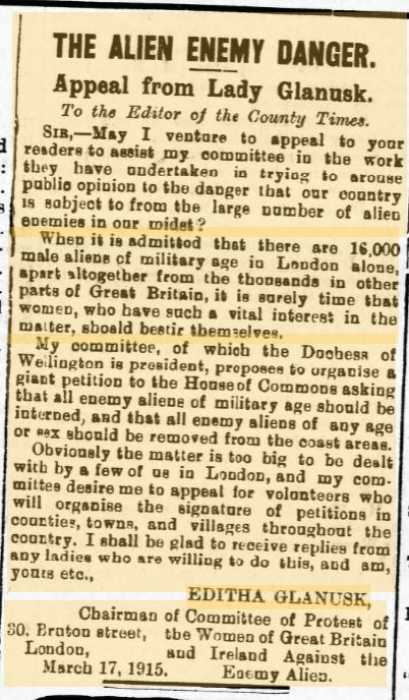 Letter to ‘The Women of Breconshire’ published in the Brecon County Times 5th November 1914. Notes: Beatrice Cope lived with her husband George in Trelleck, Monmouthshire. Here she is photographed with her younger son George, known as Eric. He was a temporary second lieutenant in the 2nd Battalion (1st Tyneside Scottish) of the Northumberland Fusiliers. The photograph was probably taken just before Eric was sent to France in January 1916. Eric was killed on the first day of the Battle of the Somme, 1st July 1916. He was just 18 years old. Elizabeth Beatrice Cope lived with her husband George in Trelleck, Monmouthshire. They had previously lived in Denbighshire. Here she is photographed with her younger son George, known as Eric. He was a temporary second lieutenant in the 2nd Battalion (1st Tyneside Scottish) of the Northumberland Fusiliers. The photograph was probably taken just before Eric was sent to France in January 1916. Eric was killed on the first day of the Battle of the Somme, 1st July 1916. He was just 18 years old. Elizabeth Beatrice Cope lived with her husband George in Trelleck, Monmouthshire. They had previously lived in Denbighshire. Here she is photographed with her younger son George, known as Eric. He was a temporary second lieutenant in the 2nd Battalion (1st Tyneside Scottish) of the Northumberland Fusiliers. 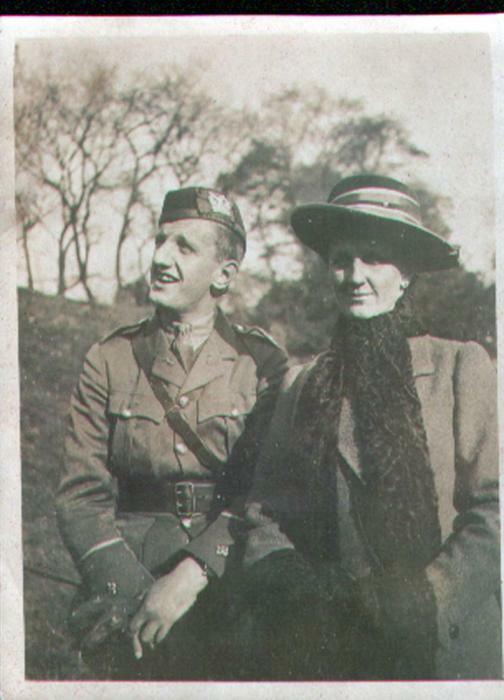 The photograph was probably taken just before Eric was sent to France in January 1916. Eric was killed on the first day of the Battle of the Somme, 1st July 1916. He was just 18 years old.